As a customer service professional, what can you do to enhance customer satisfaction and build a lasting relationship with your customers? If you answered “improve your customer service skills and knowledge,” you are correct. Unfortunately, many managers and their organizations do not take the time to invest in employee knowledge and skill building. Often, supervisors are not taught how to effectively coach and mentor employees and ongoing customer service skills training is neglected for all employee levels. Cost and time constraints are two common excuses for both of these failures. The ultimate result is lowered employee morale, high turnover, lowered customer satisfaction and increased customer churn rates. If you find yourself in a situation in which customer service skills training is not being provided, take responsibility for your own professional development. There are many options for gaining, updating or upgrading your knowledge and skills. 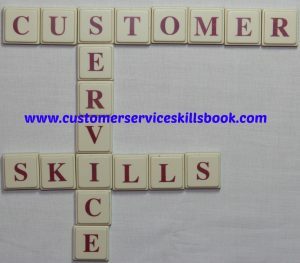 Read books about customer service. Search customer service blogs and articles on the Internet. View free videos and webinars on a variety of websites. Attend national conferences and professional customer service association meetings (check local listings on the Internet). Visit local colleges and universities for customer service classes. The key to improving the chances of providing stellar service to your customers is to focus on personal motivation and continually strive to improve your own knowledge and customer service skills. The following are specific areas that can lead to improved quality of customer service. Customer service skills. No matter whether you serve internal or external customers, you are in the “people” business. To be successful in interacting with others, you must be able to communicate verbally and nonverbally, actively listen, empathize, question in a non-threatening manner, provide appropriate feedback, and demonstrate that you have their best interests at heart. All of these skills take conscious effort on your part after you learn how to use them. Enhanced knowledge of diversity. The world is continuing to evolve related to interactions between a variety of people. This means that for you to be effective in delivering effective service, you must first understand the needs, wants and expectations of various groups. To help accomplish this: (1) Learn as much as you can about the cultural backgrounds, values and beliefs of customer groups with whom you are likely to encounter, (2) Explore differences and similarities of people from various generations, (3) Identify preferences of customers based on their genders, age, and ability levels, and (4) Recognize that people have different behavioral style preferences that affect the manner in which they react in various situations. All of these crucial components can impact customer-provider interactions. By increasing your awareness about interpersonal dynamics, you can potentially become a more effective customer service provider. Organizational and product knowledge. One of the most frustrating things that a customer can experience is an unprepared service professional. This is one who does not know what his or her organization is about, the features, benefits and functioning of products sold, and services offered. Typically, these areas are addressed briefly in new hire orientation and in information provided online or in materials provided to employees. Take the time to familiarize yourself with all of these components of the customer service process so that you are prepared to answer questions from customers and offer appropriate options when the time arises. For additional ideas on how to improve your customer service skills and improve customer satisfaction, search those topics on this blog. What skills do you believe are crucial for enhancing customer satisfaction? This entry was posted in customer satisfaction, customer service diversity, customer service skills and tagged customer satisfaction from customer service skills, customer service in a diverse world, customer service skills and satisfaction. Bookmark the permalink.